Recently I celebrated my twelfth birthday (69 in human years). I’m fine, but it’s become a challenge to go up and down stairs. And our house is FULL of stairs. Stairs down to Mama’s office. Stairs down to where Mama practices her flute. Stairs up to the kitchen, where the good foods are. Stairs up to the bedroom for nighttime snoozles. Stairs outside to chase squirrels and use the facilities. Stairs into the garage so I can go for rides in the car. Stairs … lots of them. And my (ahem) old back isn’t what it was when I was a pup. One day, Mama saw me splat while climbing stairs. Painful and embarrassing for me. One splat was bad enough, but when I did it over and over, she took matters into her own hands. And decided she needed a doggie gate to block me from the stairs. But the extra-wide gates we’d need are crazy expensive, and Mama won’t use anything that mars the walls. 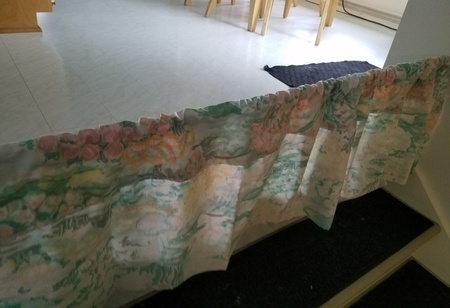 It’s an old shower curtain rod and a cloth valance stretched the width of the staircase. And it might not present a problem for active, inquisitive dogs, but no way I’m going through that thing! Sure, it makes me sad not hanging with my mama while she works. And I hate watching her climb over that barrier, knowing I can’t follow. Herding is what I do, people! But Mama says her back won’t let her “taxi” me up and down the stairs all day, so we’re both stuck. Now this could be the end of my story until one day, Mama found something called Liquid-Vet that’s given me a new lease on life. After less than a week on their holistic glucosamine formula, I’m more confident on the stairs. And Mama has removed that horrid barrier! This entry was posted in Dogs and tagged aging dog, barrier, doggie gate, Liquid-Vet, stairs. Bookmark the permalink. Dallas, I am always so happy and excited to see that you posted anytime you post on Mama’s blog! You always crack me up with your wit! Tell Mama that I loved her idea about the shower curtain rod and a cloth valance stretched the width of the staircase because it looks so much nicer (and less expensive) than a regular doggie gate. And Yahoooooooooo! Happy to hear about Liquid-Vet and that it’s working! I too take vitamin supplements (a daily multivitamin and a probiotic), and I also use holistic formula’s whenever I get sick, and they work. Glad you’re able to climb those stairs with confidence, boy! Tell Mama I said hello and to have a great week! Mr. Ron, I’m delighted to learn humans take supplements, too, and that they’re working for you. Pain isn’t a good thing, and I for one don’t like going to my dog-tur every time I ache. Well, I suppose that doggie curtain might look nice, but it’s still a barrier that means to keep me away from my mama — and that will never do! I’d stumble down those stairs just to be near her, ha! We give Lucy, who is also about, twelve glucosamine as well. In our old house, we had an elevator which was a life saver for her. In the new house, we are on one floor. I’m so happy the Liquid-Vet is working since it is a heartbreak for your Mama to see you struggle. I like the idea of the shower curtain. Best wishes, Dallas and Mama. Ah, Mr. John, at least Lucy was able to ride in an elevator. I like traveling because of those things! Mama has even considered getting one of those stairlift chairs advertised on TV and strapping me in for the ride of my life. Talk about scary!! Ha ha ha. I could see that now. Fur all over the place. How do you think that Liquid-Vet stuff would work for humans? My mind is working overtime on that one! It is great that a solution other than that shower curtain was found. The curtain was pretty creative, but it wouldn’t be any fun at all to see your mama trip over that thing! Miss Linda, if Liquid-Vet would work on humans, that company would have “a going Jessie”! And just think of all the human doctors who’d be having hissie fits over not getting achy patients to come into their offices for medicine. Oh, you’ve got Mama’s number, don’t you? You know how clumsy (er, distracted) she can be and how often she topples. Well, I’ve seen her be extra-careful on those stairs, so maybe there’s hope for her yet! As ten-year-olds we do understand the problems ageing brings to us animals. Tommy especially struggles because of an accident he had as a youngster. So glad you’ve found a medication that helps. Tommy takes Metacam every day and it lets him get up to all sorts of mischief! I don’t need help at the moment – I’m proud to say I can still be a complete pest without artificial aids! Dear Tuppence, I Dallas didn’t realize kitties were subject to aches and pains, too. How sad I am to hear that! I guess I just assumed it was only doggins because we’re a bit heavier, you know. Anyway, I think one of my doggie cousins takes something that begins with an ‘M,’ but I can’t recall. I guess it helps him move easier. It’s a real challenge, this getting older-thing. Hugs from across the Pond!